WiFi Meter is a simple but powerful tool for signal strength testing, network response time and network optimization. Get faster, more reliable WiFi now! Find the best WiFi location in your house, around town or at your company with WiFi Meter. As you walk around, WiFi Meter displays a real-time signal strength meter. At the same time, Geiger counter style audible clicks beat faster as the signal improves � making it fun and easy to see and hear how to improve your WiFi performance. No need to guess anymore. Let WiFi Meter help you find dead zones, position your WiFi antenna, determine the best location for your router, and where to sit to get the strongest and fastest connection. And WiFi Meter lets you run speed tests to find out the actual speed of your WiFi connection at a specific location. A faster connection also extends your battery life as you don't need to keep your device on as long as you complete tasks faster than ever! 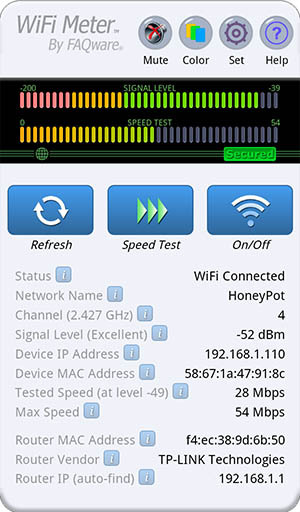 WiFi Meter displays detailed information about the connected WiFi network, such as channel number, frequency, IP and MAC addresses. It�s a simple but powerful tool for any user. 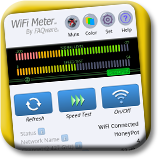 So add WiFi Meter to your trusty tool box and enjoy better WiFi. An incredibly informative and useful tool!